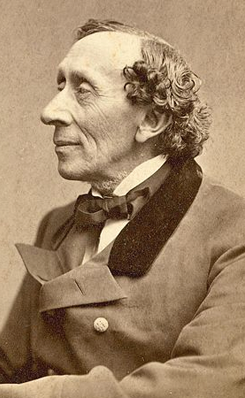 ﻿ Visitandersen.com | Hans Christian Andersen - Croak! All the birds of the forest were sitting upon the branches of the trees, which had quite enough leaves; and yet the birds were unanimous in their desire for more leaves – the “leaves” of a journal; a new, good journal was what they longed for – a critical newspaper such as humans have so many of, so many that half of them would be sufficient. The songbirds wanted a music critic, each for his own praise – and for criticism (where it was needed) of the others. But they, the birds themselves, could not agree on an impartial critic. They agreed that the paper should be called Morning Croak or Evening Croak – or just Croak. They unanimously voted for the latter. It would fill a long-felt need in the forest. The Bee, the Ant, and the Gopher promised to write about industrial and engineering activities, in which they had great insight. The Cuckoo was nature’s poet. Not counted among the songbirds, he was, however, of the greatest importance to the common man. “He always praises himself; he is the vainest of all birds, and yet not much to look at,” said the Peacock. “Such an air rover!” said the Frog about the Stork. “I actually looked up to him when I was little and felt a trembling admiration. And when he walked in the marsh and spoke of Egypt, my imagination carried me to wonderful foreign lands. Now he doesn’t impress me any more – that is all just an echo in my memory. “I have become wiser, rational, important – I write critical articles in Croak. I am what, in the most correct and proper writing and speech of our language, is called a Croaker! Original Danish title: “Qvæk” translated by Jean Hersholt.